Our radial-gripping, pile-handling tools are the safest, most efficient way to lift, move and position large-diameter pilings for offshore platforms, conductor pipe for oil and gas wells, and other large-diameter tubulars. The remotely operated tools use a powerful radial-gripping action to hold heavy pipe sections securely without costly and clumsy attachments. All of our handling tools have radial-gripping segments that hold pipe around its full circumference without deforming or damaging the tubular. The hydraulic-actuated internal lift tool stabs into pipe sections for pick-up and lay-down and for moving or holding in a vertical position. The external gripper, which can be either hydraulic or pneumatic, is a stationary device that grips pipe strings from the outside while sections are added or removed. Our standard tools are each designed to handle a specific range of pipe sizes. Easy size adjustments can be made by adding or removing standard spacers on the gripping segments. Standard spacers can also be machined in any shop to suit non-standard pipe diameters. 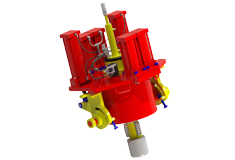 Motional compensated models are available for smaller casing applications. Radial gripping segments spread the force evenly and will not damage the piling or conductor. Forged, tapered mandrel expands and retracts gripping segments by hydraulically moving up and down. Hardened-steel gripping inserts are replaceable. Gripping segment spacers can be changed out for different size pipes. Horizontal pick-up arm and conical nose facilitate stabbing and lifting.